Like too many things in this world, the bees ought to fear the humans. And we ought to fear ourselves. The good news is there is always hope! No need to wallow in fear when there is work to be done! Bees are a keystone species? Many of us grew up thinking of bees somewhere along the spectrum between picnic nuisance and deathly fear of all buzzing pollinators. 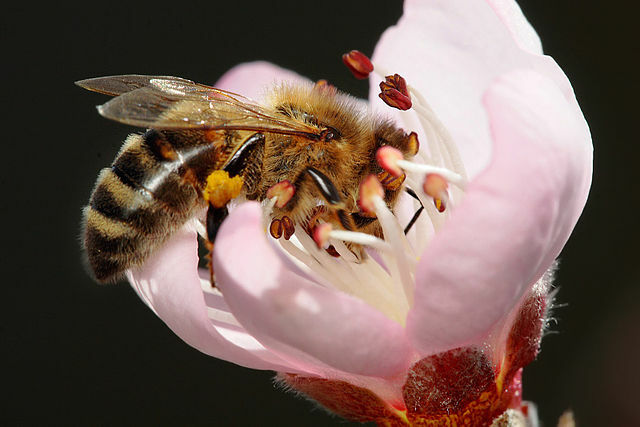 Unless you lived on or near farms you may not have realized how essential bees are in the agricultural puzzle – $15 billion in increased value and about one in three bites of food we currently enjoy. 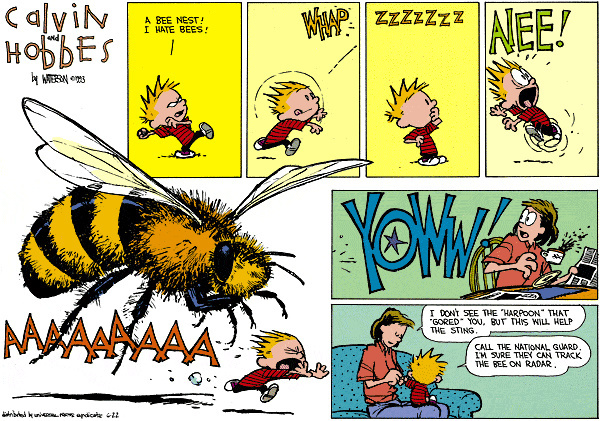 As a child, I only had a vague idea bees were important to their ecosystem. Bees have long suffered from the mysterious Colony Collapse Disorder, but at no other point in history has their decline in numbers and safe havens been so rapid and fraught with controversy and uncertainty of cause or solution. Many studies point to pesticides, neonics (or neonicotinoids) in particular, as one factor of the recent massive bee die-offs, and therefore putting our entire food system in peril. Living in Oregon, it was hard to escape the horror of the tens of thousands of bees who fell dead to the ground in a Target parking lot. That is the stuff of nightmares. This led the state to issue a temporary ban on the use of the harmful insecticide to determine what plans need to be put in place going forward. What do we know about the role of neonics and bee deaths? — We know that neonics cause certain harm, death, to bees under certain conditions. Those conditions are what the scientific community is debating. — Although “low level exposures do not normally kill bees directly, [but] they may impact some bees’ ability to foraging for nectar, learn and remember where flowers are located, and possibly impair their ability to find their way home to the nest or hive.” Meaning bees will be harmed one way or another after enough exposure. — The European Food Safety Authority, when asked to perform a risk assessment of neonics, found “a high acute risk to honey bees,” as well as both flaws and data gaps in the industry-sponsored studies used as scientific evidence in safety assurances. — Bees are exposed to neonics through commercial agricultural uses (dust drift, residues in nectar and pollen, reduction in pollen diversity), commercial landscaping (direct insecticide use for ornamental plants and trees), and home landscaping and garden use (potting soil and direct insecticide use). What can we do about these bee die-offs right now? — Read, learn more. You’ve already read this so we are off to an excellent beginning! Now direct your attention to this lovely Buzz on Bees and Making Your Garden Count Blog Carnival and all the information you can glean from it. — Choose neonic-free products. Grow organic plants in organic potting soil. Avoid shopping at the mega-garden centers who sell plants and soil that have already been treated. Avoid neonic-based insecticides for home use. — Take action! Call on retailers to commit to stop selling neonics, as well as plants and seeds pretreated with these pesticides. Sign the petition and share it widely! If these are big steps for you, take your time to learn as you go. Use the wisdom of your locally-owned plant nursery or college extension program. There are a lot of resources to help you continue on your path to creating a better world for the bees around you, but we all need to take the first steps! Please share any tips on how to make your yard and garden more bee-friendly! Will you take any action today? I am so glad you were inspired! The Xerces Society is an incredible resource. Good for you for staying away from insecticides/pesticides, now we need to get the word out about all the products we need to avoid – including the plants and soil sold already sprayed with neonicotinoids! It is amazing how many items have neonics and they have so many different names. It is sad that it is such hard work to be an informed consumer. And it shouldn’t have to be such hard work! Wouldn’t it be nice if everything had transparent labels and we actually knew what we were using? I think the fact that people are buying plants that have already been treated with neonics without knowing it is most shocking. Best thing to do is grow flowers that bees love such as bee balm,russian sage, etc. Great article, Brenna. Very informative. I live in a condominium community and will speak to the board of directors to bring this to their attention. I’m sure the landscape company we do business with uses products that harm, maybe we can change that. Love the new look here at Almost All The Truth! That would make such a difference! Let me know what they have to say. Thank you for being a bee champion. I’ve stopped buying plants and dirt at Home Depot because of articles like this. I’ve been concerned about the decline in bees too – I’ve been aware of it for about 15 years. I’m always conscious of trying to avoid harming bees if I can help it – like if I can shoo one away rather than kill it, if that makes sense? That makes sense, lol. 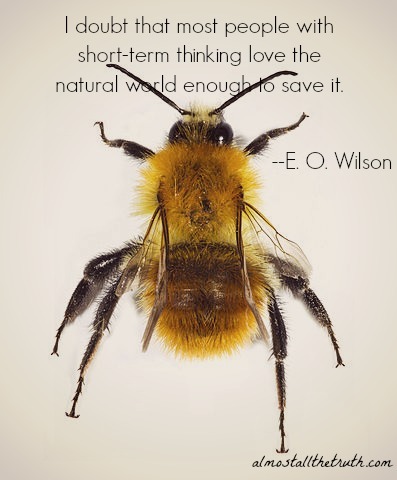 Did you sign the petition to help protect the bees on a broader scale? Sadly we live very near the incident of tons of bee deaths here in Oregon. So sad! It’s strange but I feel like it’s noticeable how few bees there are now. I remember seeing them everywhere and now I can probably count on my hand how many I’ve seen this summer.